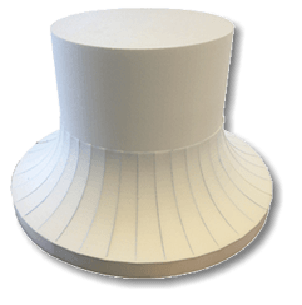 Expanded polystyrene or EPS is a lightweight cellular plastic foam material derived from petroleum and natural gas by-products. EPS is economical, sturdy and efficient and meets the Standards Association of Australia AS 1366, Part 3 - 1992. No CFCs are used to mould EPS. Phone Koolfoam and talk to our experienced staff. Get a FREE CAD Design service available. We find the best sizing for the best price! Compression at 10% deformation, min. Expanded Polystyrene is the number one choice for your next construction job. Bridge, rail and road widening schemes. Concrete formwork - Void former can be manufactured to most shapes specified by designers for projects such as bridge beams, elevated motorways etc in which void forming is fundamental to modern design. The graphite particles in expanded polystyrene (EPS) reflect and absorb heat and infra-red radiation result in up to 35% more efficient insulation than white EPS. Koolfoam polystyrene in the marine environment. eg a cubic metre of EPS with a density of only 16kg/m3 has a buoyancy of 984kg! Empty enclosures can be punctured and lose buoyancy but a fill of EPS prevents sinking whilst EPS stays in place. Installation is quick and easy requiring minimal labour and therefore expense; its non-irritant, non-allergenic and odourless nature makes it superior to other insulation alternatives. Koolfoam EPS is light, water and steam resistant, unaffected by fungi and bacteria, and will not support insect or pest life. Prolonged exposure of EPS to UV light causes yellowing and embrittlement. 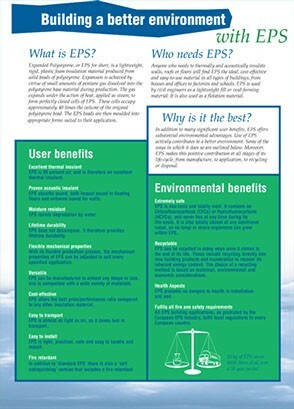 Koolfoam recommend protecting EPS from direct outdoor exposure. 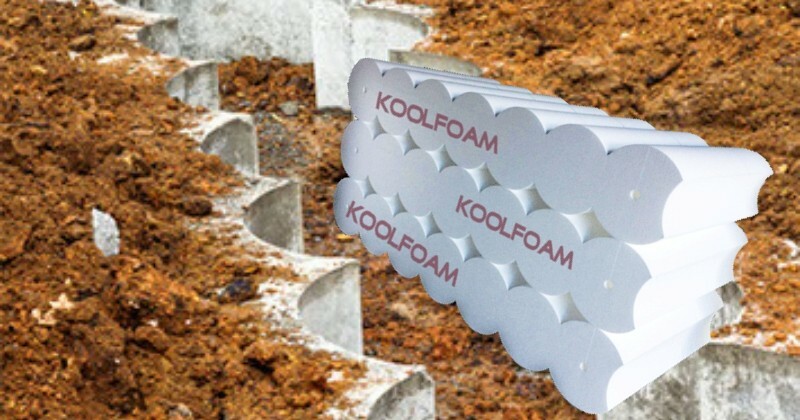 Koolfoam EPS is comparatively inert and is unaffected by mildly acid or alkaline building materials such as Portland cement, lime or anhydrite. It is however soluble in many organic solvents and may be damaged by certain commonly-used paints, adhesives, wood preservatives, pasting agents etc. in some cases vapour from these substances can be harmful. Koolfoam EPS has no nutritive value for micro-organisms and does not rot. Under certain conditions soiled material may carry fungi etc but it is not itself attacked. Even soil bacteria have no effect on EPS. Rodents and birds may occasionally attack exposed EPS; Koolfoam recommends protection with galvanised wire netting if necessary. Other materials: EBS Notes on the Science of Building NSB66.